Pizza is love. Still wearing their high school varsity baseball uniforms and eye black, my sons made pizza after the game. Friends joined us and some of our pizza was delivered to other friends. Family, friends, and pizza together is big love! Pre-tip: Purchase day old loaves of whole (not sliced) Italian style bread. I find mine at a reduced price at my local grocer. Freeze the loaf if not using that day. While not necessary, the dry loaf improves the texture of the pizza. Italian sausage is my favorite! 1. Preheat oven to 350 degrees. Divide the following tasks up among available family and friends. or foil for easy cleaning. 3. Make sauce. This recipe is very forgiving so just use the seasonings you have on hand. 4. Spread sauce on flat surface of loaf. 5. Add toppings. We add toppings before the cheese because it holds together well, but if you prefer to see your toppings, add after cheese. 6. Grate cheese and spread over loaf. 7. Drizzle cheese with olive oil and be sure to drizzle some on loaf edge. 8. Bake on middle oven rack for around 15 minutes. 9. Let cool for 5 minutes, if you can wait :), and slice. My favorite way to cut this pizza is with Pizza Scissors. Thank you for the link to my post. I look forward to reading your blog. You’re welcome, and my privilege, Jovina! Sounds yummy. Two things I’ll go to my grave missing in our ketogenic lifestyle are pizza – and I mean good, hearty pizza – and sourdough bread – and I mean good, authentic, San Francisco sourdough bread. Maybe when I step into eternity, my glorified body won’t gain weight from carbs and I’ll be able to enjoy them again. 🙂 Happy Friday, Angie! Hey Angie, that’s lovely, you’ve made me hungry for pizza again ! Looking good as always Angie! Most of the time I get the prepackaged dry mixes, pay about 50 cents a piece. It takes two of them to make a pizza but I like having them on hand for when I’m in the mood since I’m a 20-mile round trip to pick up take out pizza. I have a big freezer and keep the mozzarella on hand. I could do that with the bread from the bread store too. Great idea! I get them at Walmart and Kroger which are my two main grocery stores. Have a great weekend too! 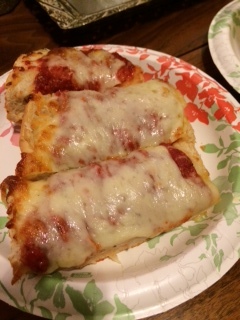 Oh, and the other nice thing about using the dough mix is that you can use it for stromboli & calzones as well as homemade hot pockets for the kids. Oh Angie, it looks delicious! I adore French Bread Pizza, and this sounds like it’s a close cousin, just made with Italian Bread. Yummy! I am intrigued by pizza scissors. I’ve never heard of them. They sure would take up a lot less precious drawer space than one of those big rocking cutters! I hope your guy’s teams were the winning ones!